A new era in UK postal deliveries has come into effect with the end of the Royal Mail's 350-year monopoly. For the first time since the reign of Charles II, rival firms are able to collect, sort and deliver mail. Yet, households are unlikely to see any change for quite some time, as the 14 new providers are likely to stick to the lucrative business mail sector. The Royal Mail will be the only firm that has to provide a service for every address in the UK. The main postal union, the Communication Workers Union (CWU), has opposed the opening up of the mail market, saying it risks the future of the universal mail provision. It points to the fact that the Royal Mail currently uses the profitable business delivery sector - in which it is now going to inevitably lose market share - to subsidise the loss-making domestic postal service. State-owned Royal Mail currently loses 5 pence for every first-class letter delivered and 8p for every second-class letter. Yet postal regulator Postcomm says competition in the UK market will give customers choice and create a more efficient and reliable service. Watchdog Postwatch has also backed the change. "A competitive market place... is the best way to protect customer interests," it said. Yet it added that "for the foreseeable future, social customers are unlikely to be able to post mail in pillar boxes provided by another mail company". The Royal Mail has cautioned that it will need greater freedom to put up stamp prices to offset the loss of business or "franked" mail, but it also says it is ready to take on its new rivals. "Royal Mail will fight hard for every single letter," said spokesman David Simpson. The CWU's warning has been mirrored by the influential House of Commons Trade and Industry Committee, which has called the ending of the Royal Mail's monopoly "untimely". 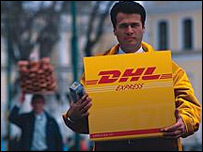 The 14 new firms entering the UK mail market include DHL, part of Germany's Deutsche Post, and Dutch mail company TNT. 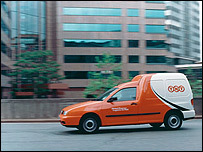 "We do want to create our own delivery network [in the UK], but that will take time and you probably won't end up with Orange [TNT] pillar boxes everywhere, because us handling your grannie's postcard is unlikely," said TNT Mail UK chief executive Nick Wells. Before the new liberalisation, rivals to the Royal Mail were limited to the bulk mail market and deliveries of 4,000 or more items. 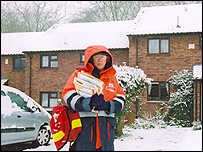 Postcomm forecasts that the Royal Mail will still have nearly 90% of the UK mail market in 2010. The first European country to open up its mail service was Sweden in 1993. The German and Dutch markets remain closed, but under a European Union rule all countries must liberalise their mail markets by 2009. The UK mail market is officially opened to competition from 1 January. However, as this is a Sunday and 2 January is a Bank Holiday, the change will not practically come into place until 3 January. Could more jobs go at the Royal Mail?